We made it through a year of seasonal beauty edits, with makeup that wasn't necessarily good - but was always on theme. Another year of that would be redundant - since just like with my wardrobe, I'm mainly wearing what I have already, with a few new bargains thrown in. So I'm going back to my original review roots, with both makeup and clothes included, in edits by colour. Lipstick, Christmas Pyjamas and Valentines Hearts, that's where I thought red would stay. But the shade has crept up on me slowly, by ways of Berries and unassuming accents, to year round bright lips and 'if the shoe fits'. What started at TinkyWinky bag, led to full blown Po - and before I knew it, 'colour to feature in my room?' - I'm seeing-red. 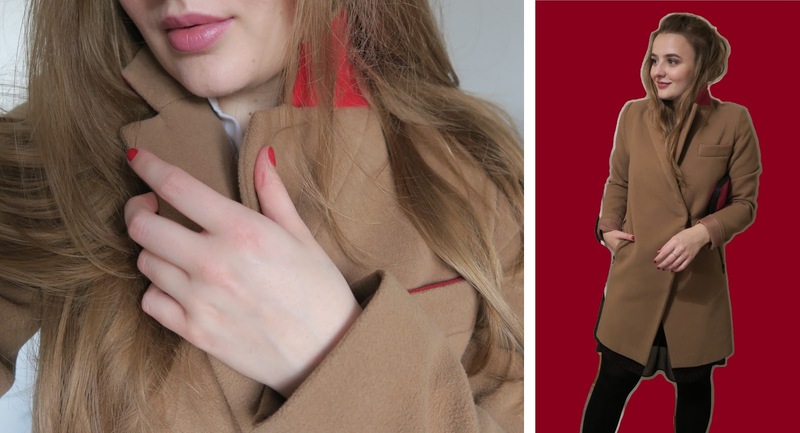 Starting subtle with my ASOS petite, Camel Coat with contrast collar (circa 2014), that was gifted to me for Christmas. 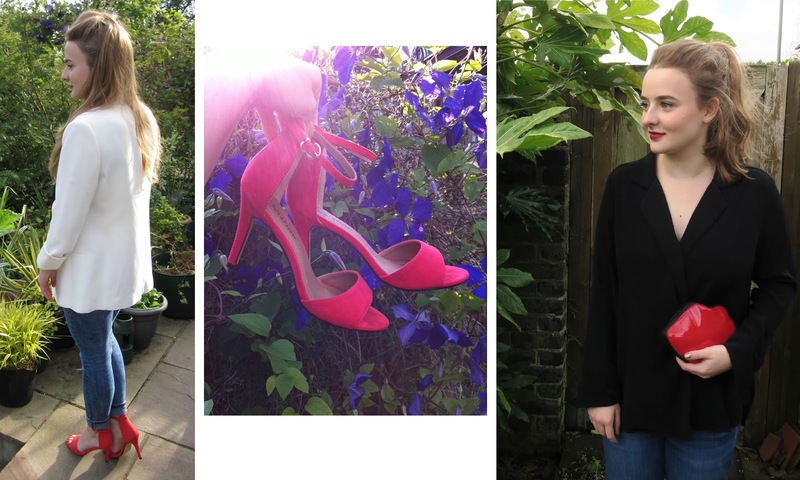 First seen and swooned over, on blogger The Little Plum, but not at the original price; unfortunately, a suitable secondhand size took it's time, but unlike with many items that are long awaited - this did not disappoint. The asymmetric flattering cut has been unrivaled on my searches since it's release, but that colourful collar is the cherry on top. Only seen when I want it to be - the collar/cuff contrast is something I now want on all my coats, to pop the colour. Ready made Colour Block, in the form of my M&S funnel neck Chevron Jumper, found in the sale for £18. A Jazzy Jumper not just for Christmas (or to disguise a cockerel neck); it's a rainbow, bright jumper, with comfort blankets of cream and grey - in keeping with the theme in tone AND materials, since this is seriously toasty, even despite the 2/3 sleeves. - Zara striped T-shirt Dress, and failed pre holiday find for £7 from DEPOP; I like the stripes, but dislike that it doesn't reach my legs. - F&F checked Shirt Dress (from a 3 for £1 car boot stall); crepe and shirt dress preference, meant it survived the plaid Cull. - The fanciest of the 3, French Connection Tea Dress, £6.50 from the Children's Trust CharityShop; that looks like red leopard print from afar. I'm not convinced that the 2 mix, but I like the fit; it feels extra flamenco thanks to the flouncy sleeves, but does easily fray. Sadly, none have reached ultimate emoji potential. 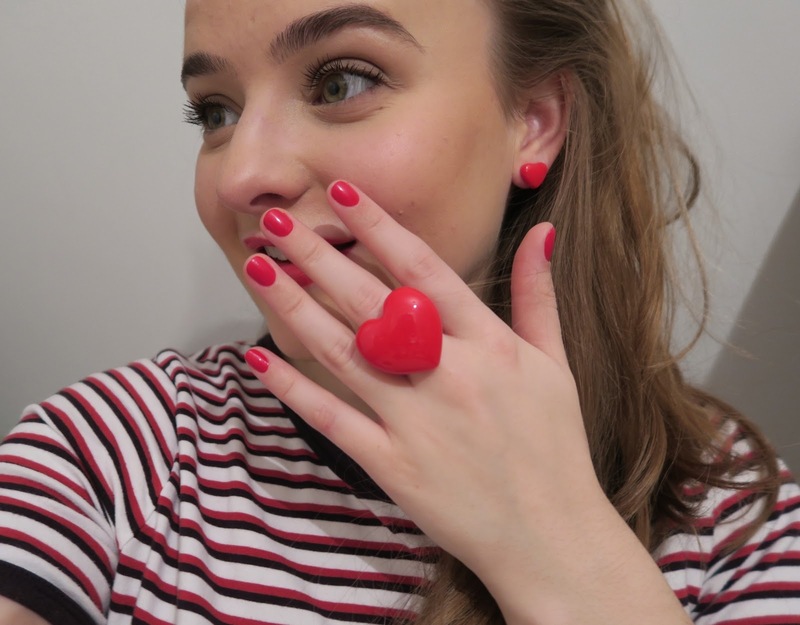 I'm not really into Kitsch Jewellery, but this set from Primark is sharing the love one plastic heart knuckle duster (or earlobe crusher) at a time. More stereotypical for me, in Silver - but still with sass - my charm bracelet is a sentimental piece I have added to over the years, and thanks to national pride (and coming of age cocktails) red is made a feature on my wrist. The rumours about red Bags are true - they make the ultimate colourful accessory - and this (also emoji like) Lulu Guinness lip tote, is as effective as the bold lipstick its inspired by, at making a statement. Reversible, Tote-to-Clutch interchangeable; blog prop, and inspiration behind the post. Mwah. Strappy Sandals, seen a lot on this blog - that despite the fiery shade, ended up being the only heels I kept after my wardrobe clean out. Not only does it show the versatility of red, or that my wobbling in 5+ inches clubbing days have been firmly put to bed, but how the statement has become my new neutral - given that I felt no need to keep another 'just in case'. Bright red boots are also doing the rounds amongst the fashion crowd - a fabulous for winter/warmer option. Red my Lips, red undeniably does it best on the lips, and let me talk you through my spectrum. Rimmel's Orange-ology makes for a great grilled Tomato Red, though Sleek 'Riojo', is my current vivid-red liquid lip obsession; collection's 'Cherry Pop', caters as an orange red creme lipstick option. Avon make a good alternative to Clinique's 'Cherry Pop', but it's main claim to fame is being the medium in which I made my blogger banner with. Now kept simply for sentimental reasons. I find Lipgloss a risky format in this bold a shade, but Barry M's 'Valentine' is kept just in case, though would not recommend for namesake day. Lastly, Rimmel '111' is my most neutral red, and I would 100% buy again by merit of a great tried and true formula. 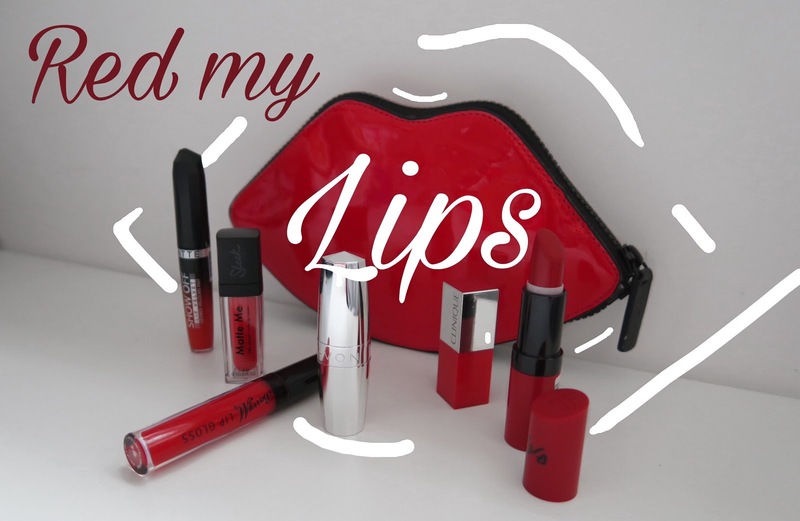 Most shades are shown somewhere in this post on my lips, since pairing something red with a red lip is a look that will never grow old; also, since it's helpful. If you consider clothes or lipstick too much, an unassuming accent would be by nail polish. Thanks to magazine freebies, I've amounted quite the stock of nails inc polishes - incl reds, and a few backups. Quality polishes, for a fraction of the price - these apply and last so well, but by no means are they the only good option. Makeup packaging is maybe pushing the theme a bit far, but doesn't it make a pleasing picture? I featured the makeup in my jewellery closeup: l'Oreal infallible I like, but ended up a little yellow - Rimmel 'lasting finish Concealer', is my everyday blemish concealing STAPLE, with no colour issues - No7 Mascara, that sadly doesn't live upto it's red sparkly packaging. Tools, is something I want to give more attention to. Before I was aware of Real Techniques, Revlon was the brand behind my brushes. A 'Crease' Brush, forgotten since I now own better. A 'Dual sided Angled' Brush, that I accidental sharpened and ended up preferring (which is saying something). The Concealer Brush has though managed to find it's place, alongside cream pigments and rich eyeshadows; thanks to it's flat densely packed shape, that beats the precision of fingers for size, it works amazingly at managing to pick up the product, but also allowing the product to apply to the skin. At the other end of the price spectrum, Smashbox let me down with their contour brush that came as part of the palette kit; badly cut, sheds and feels very plasticy - they shouldn't have bothered. Since I've yet to try it on the cheeks or eyes, there isn't much variation in cosmetics in my collection involving red, yet. But I am always open to new eyeshadows, and this NYX look is putting the No7 mascara to shame.